When we got Rack, our McNab SuperDog (TM), we needed a place for him to call his own. 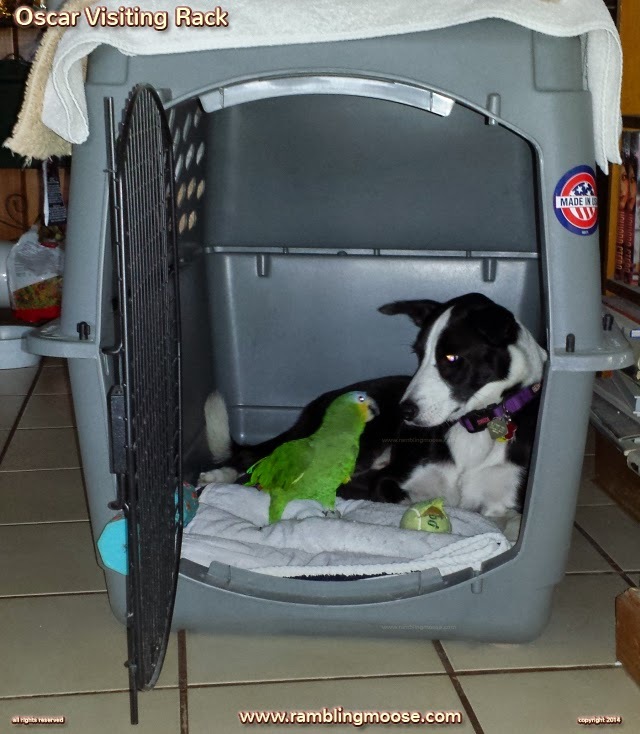 Some say that "Crate Training" a dog is wrong. All sorts of negative words would follow. The reality is that it is more like a Room For The Dog than a punishment. They are "Den Animals". 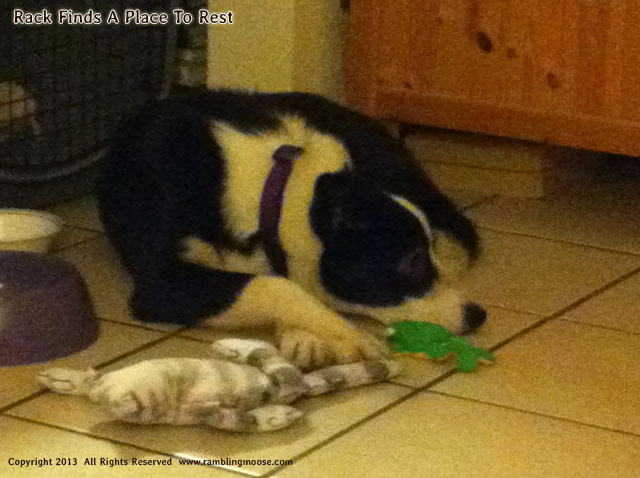 Dogs actually like to find corners and semi-enclosed places to go so they can sleep, relax, and even hide. It isn't always an indication of fear, it's more like a place to go where they can be "off duty". The duty of being a dog in a human's pack can be a lot of work. We had a crate for Lettie but shortly after she joined us, she decided it was for lesser creatures and she preferred to sleep in the room with me, next to where I was on the floor, at the side of the bed. The crate was kept for emergencies and we eventually took it to the thrift after she passed on. When we got Rack, we needed new. Knowing that a McNab Dog is a "medium sized" dog, we knew that we'd want a large crate. Give the dog plenty of room to grow. The debate of wire or plastic happened, and we felt that a plastic crate would be quieter. It would be safer since there are fewer places for paws to get stuck. It joined us in the car on the way to get him and has been a fixture in our cramped little house ever since. The trip back he spent in the crate in the back of the car and has always found his way back. But we had joked about how this night stand sized table could fit a person. 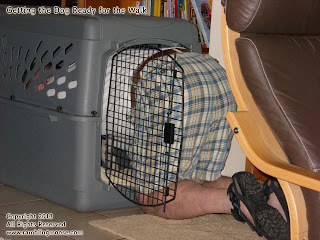 Since I am tall, I just rejected the idea that a Full Grown Man Could Fit In That Dog Crate. I want to move the crate. We don't have any room, it's huge. We've got plenty of room! No room until construction is finished. We've replaced all the windows in the house (except the one) and then the Air Conditioning failed. Both projects are waiting completion and need inspection by the city or the county or which ever bureaucratic body is in charge of that sort of oddball nonsense in our quirky little island. At least we will know that it was done "To Code" when that happens, whatever that means. We can always put the thing in the Florida Room! Sure, but we need to clear that out. It's huge. It's big, but not Huge! It's huge. That's where you "Hide The Bodies". Not me, mind you, but a small child could go in there. It's not that small, I could climb in there. I laughed as I saw Kevin wedge his shoulders inside the door of the crate. I have to do some serious twisting around to get into the thing to clean it, preferring to lift the top off and clean it from above. It got weirder. I watched Kevin haul his torso into that grey plastic box. 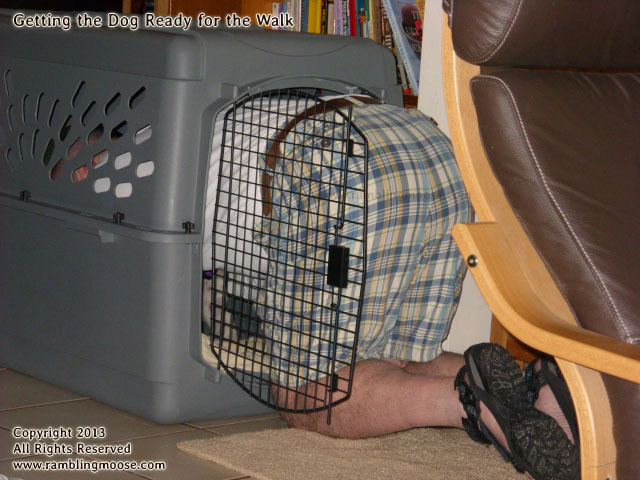 His nose was sticking through one of the air holes before he turned around and pulled his feet into Rack's crate. Rack came over and sniffed around the commotion. He sat down next to the crate, gave Kevin's nose a sniff and a lick, then looked at me to say "What's Next?". If you don't come out of that crate, I'm going to close the door and lock you in. Empty threat, the door is easy enough to open from either side as long as you have Opposable Thumbs. Go ahead, close the door! I did. Snapped the latch closed. At this point we were both laughing so hard that Rack began to back away and head off to do Dog Things, whatever they are. Kevin leaned forward and unlatched the crate - from the inside, and climbed out. Apparently I was wrong. You can put a full grown, 5'11" man inside of a dog crate and he can get himself out. Just not me. I'm 6'4" and won't fit.